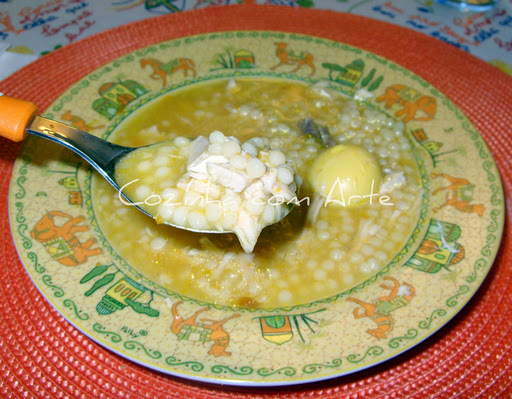 Sopa da Galinha (Canja) Re-posted especially for Lucy who has a thing for soup. Have you ever said, “It’s easy as pie.”? If you’ve ever made a pie from scratch, you know it isn’t as easy as it sounds. The Portuguese saying is, “É canja!” It’s as easy as making chicken soup. I think making chicken soup is than making a pie from scratch (let alone one made from flour, shortening, and all the rest). It does, however, take time to do it right. This is not a microwave recipe. But it is good. Additionally, a popular proverb states: “Cautela e caldos de galinha nunca fizeram mal a ninguem.” (“Caution and chicken broth never did anyone harm.”) This is a basic recipe. Most cooks have their own signature touches they put in their Canja. My special touches: Italian parsley, garlic to your taste, one whole onion stuck with four or five cloves, a whole turnip or yellow turnip (also goes by rutabaga or swede) (not sliced or diced), a handful of fresh herbs tied in a bunch and dropped into the broth. Wash the hen in cold running water. Remove the eggs (found inside the hen), liver, gizzard, feet and heart, and reserve them on the side. Put the hen in a large pot, and add the chicken’s feet, the water and salt or other seasoning you may like. Bring it to the boil. Turn the heat down and simmer until the chicken is tender. This may take several hours. Skim off any foam that forms. When the broth has reduced to 1/2 quarts, put the gizzard, liver, feet and heart into the broth. After 10 minutes, slowly add the rice. Cover the pot, and let it simmer for approximately 20 minutes, then add the chicken’s eggs and cook ten more minutes. Take out the gizzard, heart, feet and liver. Put the feet to the side, and mince the rest with a knife. Put some in each soup plate along with some of the hen’s egg(s) and some minced parsley before you add the broth and rice. Serve with fresh bread. The Portuguese often use a soup as the first course of a meal, so there is no need to have the meat in your soup, though if you want it for a main dish, you may certainly add more meat. Or, you can use it to make something else. For many of the older Portuguese women that I knew in Portugal, having a chicken was a rare Sunday treat under Salazar’s rule. That being the case, one would wish to make it stretch as far as possible. I never actually ate any chicken feet, but I was given to understand that it was an honor to be offered one of the feet. Do you have a special recipe for chicken soup? Is this recipe easy? You can use regular chicken eggs, but only the yolks. Hope you enjoy it! I shall give it a try at the weekend! Thank you once again. Aha! I think I could dine quite happily in Portugal. You know, I just recently met a Portuguese guitarist! He’s from Portugal. Great player.